Exporter of a wide range of products which include Hexagon Weld Nuts, Hex Nut, Hexagon Thin Nut, Castle Nut, Hex Connection Nut and Hexagon Castle Nut. With our spacious experience & knowledge, we are engrossed in offering a superior quality array of Hexagon Weld Nuts which are demanded in engineering, automobile, chemical and other industries. Our offered nuts are extensively recognized for their maximum strength and excellent durability, made available in different sizes. Provided nut is well inspected on different parameter to make sure their superb quality. Our company supply hex nut. Our products are of top industrial grade. HEX ZP 1/3' Thread With Hex Nut, Size: Dia 4mm to 30mm or 3/16' to 1.1/2' Length: 10mm onwards or 1/2' onwards full thread. We have marked a dominant niche in the markets by offering a broad spectrum of Hexagon Connection Nut that is manufactured by our deft professionals using quality tested material and ultra modern technology. Offered nut is perfect for fastening different items, our offered nut is widely acclaimed among our respected clients for its superb features. Furthermore, cients can buy this nut from us in varied sizes, grades, dimensions and other specifications. With the endorsement of our adept professionals, we are engaged in offering a qualitative range of Hexagon Castle Nut. Our offered nut finds its usage in different engineering industries. Provided nut is manufactured by making use of top notch quality material and high-end machines. 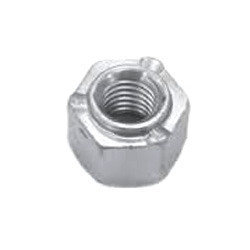 Besides, we provide this nut in various sizes and dimensions. In addition, clients can purchase this nut from us at feasible prices. With the valuable assistance of creative team of our professionals, we are engrossed in offering a wide range of Hexagon Domed Cap Nut. Offered nut is manufactured by making use of high grade material in line with the international quality standards. As per the demand of the client, this nut is obtainable in diverse sizes and other technical specifications. Client can purchase this nut from us at industry leading prices.